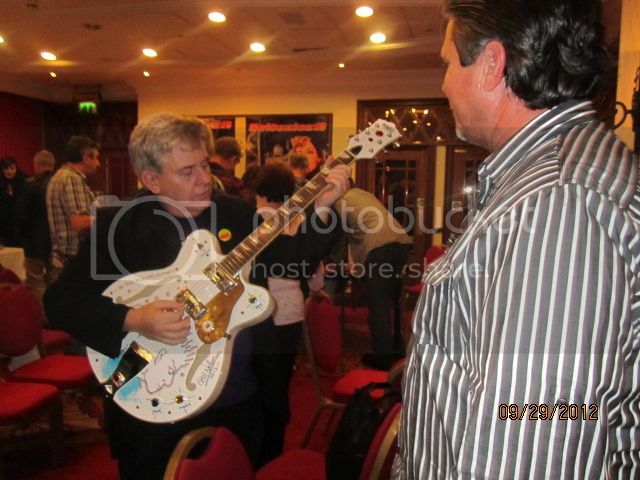 www.billnelson.com • View topic - Who won the guitar? Post subject: Who won the guitar? Post subject: Re: Who won the guitar? It was won by Kevin. (Kevin who I don't know.) I am sure Martin will post the pics soon. Who won the Bill Nelson bobblehead? "Often in the gutter, but always looking at stars!" Kevin Casler - I tuned it for him and tried Maid in Heaven out - sounds fine! Thanks for the update and the pic, Peter! That guitar looks good on you, Peter. does anyone know who won/chose the sealed "live in the air age" 8-track?